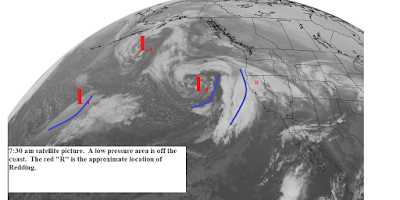 A low pressure area is off the coast and is generating bands of rain and sending them across Northern California. The low will move slowly eastward and should be east of our area by late Thursday. Expect rain heavy at times today through midday Thursday. Snow levels will be 4500 north and 5500 south lowering to 3000 north and 4000 south by late tonight and Thursday. Gusty south winds will occur today and early Thursday. The precipitation will turn to showers late Thursday and taper off during the night. Friday we will have partly cloudy skies with a few showers mainly over the foothills and mountains. Saturday we will see partly cloudy skies and then more rain Sunday as a low pressure trough moves through (see map below). Snow levels will be 3500 to 4500 feet. Monday through most of next week high pressure will be along the coast. The north state will be mostly clear with above normal temperatures and periods of gusty north winds.